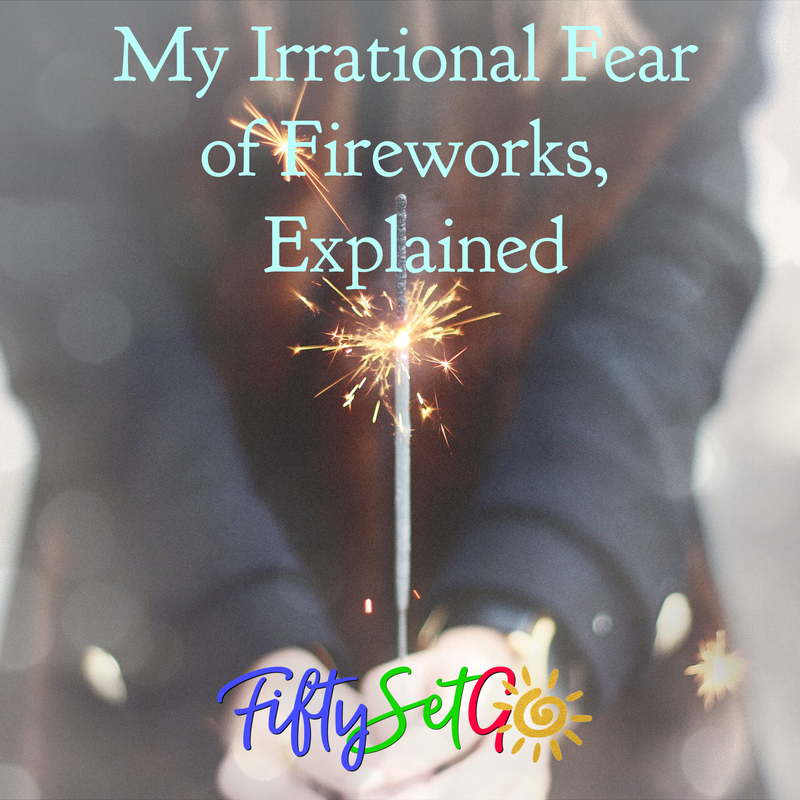 My Irrational Fear of Fireworks, Explained | FIFTY SET GO! Wait. What? How can that be? Who doesn’t love fireworks? The anticipation, the whooshing sound as they fly into the air, the surprise when they explode, showering the sky with delightful colors. Everyone loves that, right? When I was a child, we would go to my grama and grampa’s house on Independence Day to set off fireworks. They had a long sidewalk in the middle of their (always) lush, green lawn and two water sources close by, which made for the perfect fireworks launch site. Grampa spent a lot of time keeping that lawn lush and green. Mainly because he took great pride in doing so. Also because a green yard surrounding a house in Northern California during fire season is a good thing! Fire season. Every summer, the state of California catches fire. It always has, it probably always will. The mother would say it was natures way of cleaning house. To me, fire is terrifying. I always had anxiety during the summer, worried about the fire hazard (which was always posted in town on the Smokey the Bear Sign by the fire station.) I would see that sign, and my stomach would flip. Every fire that started in our area would send me into a silent anxiety attack. Silent because, I never told a soul about my fear. I’m rather terrified of fire. Every summer I would make a list of things to take with me in case we had to evacuate (we never did, although the parents were evacuated a few times in my adult years.) I also kept a small suitcase packed under my bed with some of those things. No one knew that I did that, but I was ready…just in case. Anyhow, I digress. When it got dark, they would begin setting off the fireworks. I would begin the anxiety attack. I was always terrified one would fall on me and I would catch on fire. Yes. That was my fear. Crazy? Probably a little! Sparklers? They are the devil. Little balls of fire close to the skin. They can catch your hair on fire! Burn your skin! Poke your eye out! The devil I tell you! THE DEVIL! The mother would inevitably try to make me hold a sparkler. In fact, she found joy in holding them way too close to me and taunting me because she knew I was afraid. I suppose that was her way of wanting to cure me of my “irrational fear”. Her words. It didn’t work. I never outgrew that anxiety. I don’t mind watching fireworks from afar. The cities in my area put on lovely displays. Backyard fireworks? No thank you. I fear one will land on me and I will catch on fire. I fear someone else will catch on fire. I fear someone will have one explode in their hand. I fear a dog will eat one. I now live in a neighborhood where the neighbor’s all around me enjoy fireworks. They REALLY enjoy them. The weeks of Independence Day and New Years, they set them off for days. They are loud, they sometimes shake the walls, and I fear one will land on my roof and burn my house down. It only takes one. Just a few more days of fireworks, and I can push that anxiety back down until New Years. Thank goodness fire season is only twice a year! Great post Penny, thanks for sharing; I’m sure there are many that don’t like fireworks. I like them from afar also…although I did grow up enjoying sparklers and snakes (I didn’t like the sparks on my hands!). Happy 4th of July! Oh wow! Yes!!!! I’m not alone. Good luck with fire season! I’ve not live in CA for nearly 20 years, and I still get anxious when I see the fires.